The following group types are not accepted by this hostel: Junior / Primary School, High / Secondary School, College / University, Business Trip, Sports Group, Cultural Group If you have misrepresented the type of group you are booking for, your booking may be cancelled by the hostel." Same Same Guesthouse, Bar & Restaurant offers comfy accommodation in Haad Rin, it is owned by two Danish women. Set a 2 minutes walk from the full moon beach and Leela Beach is a 5-minute walk away. The onsite restaurant serves Thai and international dishes, including Mexican, Danish and Italian foods. Free WiFi is available at the restaurant and bar area. No wifi in the rooms. This property features both private and dormitory rooms. The private rooms are equipped with either air conditioning or a fan and an en suite bathroom that comes with a hot shower. So please notice if you are booking with fan or AC. Our 6 person dorms are the cheaper option and comes with 2 hot showers, no Aircondition, but 4-5 fans in each room. The 10 and 14 persons dormitory rooms provides all guests with air conditioning and a terrace. The 10 person dormitory has a toilet and hot shower en suite. The 14 person dormitory has a toilet en suite, the 2 showers are just outside the room. There are safetyboxes with keys and padlocks for valuables and small bags in a seperate room. No lockers available for big Backpacks or suitcases. Nightguard on the premises. 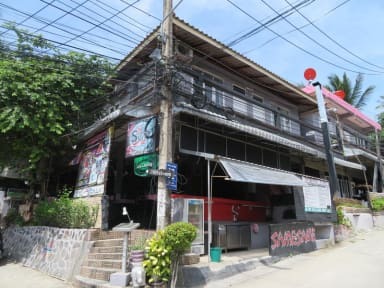 Located just a 50 m from the main street, Same Same Guesthouse, Bar & Restaurant is surrounded by several shops, restaurants and massage spas. Day tours can be arranged at the travel desk. In the week leading up to the Full Moon there is different events happening every night, such as Beer Pong Tournament, Pub Quiz, Bodypaint Contest etc. It is easy to meet other travellers and it is known for its social atmosphere. We therefore reccommend guests to check in 2-3 days before the Full Moon Party to join the social events. On Half Moon Party Night there is a warm up with free bodypaint and beer pong. And Half moon tickets are sold and taxis are arranged.